We are lucky to have two stores in Shishmaref. Their selection is amazing compared to the stores in other villages we've visited. However, their inventory isn't exactly reliable. When we lived in Seattle, I would go to the store to buy, say, milk. I would drive to the store, walk in, pick up the milk, and go home satisfied. In Shishmaref you can't go to the store expecting anything. They may or may not have it. They may also have something completely unexpected. I've learned to just wander over to the store every once in a while just to scope things out. I've also learned to buy whatever they have- no matter what it cost. Today I went to the store to get something to drink, and it ended up being one of the best shopping days EVER. 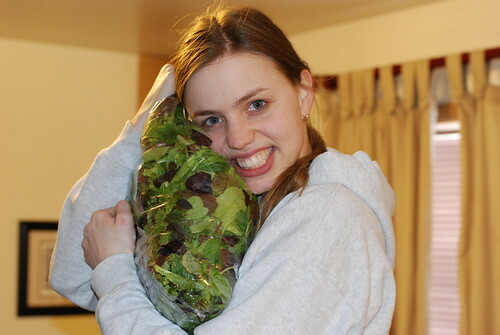 I was especially excited about the large bag of salad fixings (which is why I am tenderly embracing it). When I carried the bag to the cash register, the employees had no idea how much to charge me. It turns out that the bag arrived in a big mis-shipment (which explains why so many fresh things were at the store at the same time). After searching the inventory lists, they decided to charge me $8.85! I was so totally amazed. That it about the same amount I pay for a head of iceberg lettuce at the store normally. 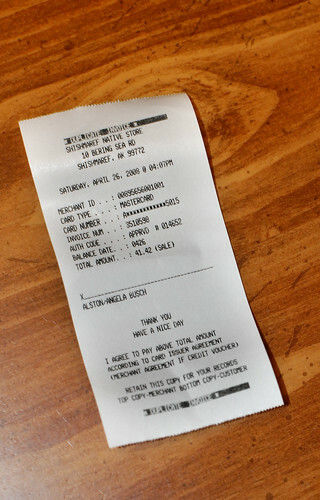 The best part was when they rang up the total. Only $41.42! That may sound like a lot, and I would have once thought the same thing. But, it is an absolute bargain for Shishmaref shopping. We will be eating lots of salad over the next week, but that's okay! I am willing to completely adapt my entire eating schedule any time the store has produce.